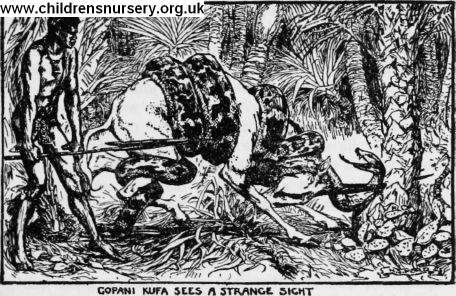 Gopani-Kufa at first was afraid, thinking of what the antelope had said, but finally he consented and followed Insato into the forest. For several days they travelled, and at last they came to a hole leading deep into the earth. It was not very wide, but large enough to admit a man. 'Hold on to my tail,' said Insato, 'and I will go down first, drawing you after me.' The man did so, and Insato entered. Down, down, down they went for days, all the while getting deeper and deeper into the earth, until at last the darkness ended and they dropped into a beautiful country; around them grew short green grass, on which browsed herds of cattle and sheep and goats. In the distance Gopani-Kufa saw a great collection of houses all square, built of stone and very tall, and their roofs were shining with gold and burnished iron.